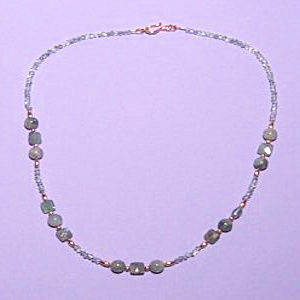 For this necklace, I purchased high quality Labradorite beads with lots of "labradorescence" (a blue sheen over the beads). I used only the best beads of what I purchased. It's beautiful! 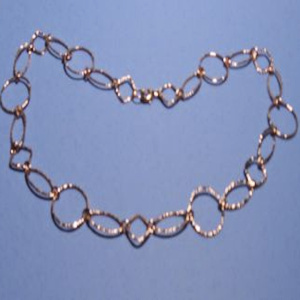 I love working with hammered links and these are especially high-quality. The necklace is a little longer so we can take advantage of the draping of the links. 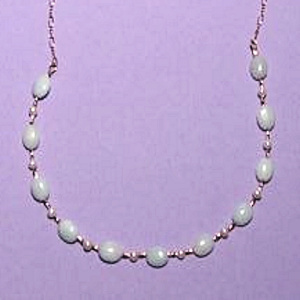 This is a delicate-looking necklace with small pale Amazonite gemstones and Freshwater Pearls. You will be taken to the "ProPay" website for credit card purchases. Follow their instructions to purchase the item. ProPay will send you a receipt. Your credit card bill will show the purchase from "CEN Studios". I will also receive a notice of your purchase from ProPay. and send an email to you so that you know your purchase has been processed. I will send your item to you on the next business day. Very Important - make sure all of the info you give ProPay is correct, including your email and mailing addressses. 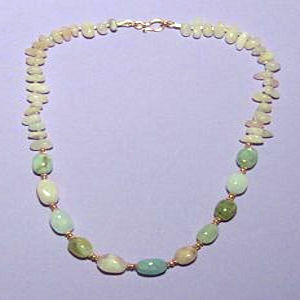 Lovely Amazonite and Beryl Gemstones play off the tiny white crystals. This is truly a beautiful necklace. Fancy Jaspers come in such rich colors. 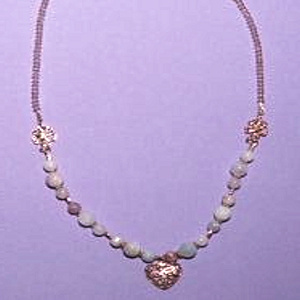 The beads in this necklace are also cut in various shapes and the small rondelles are faceted as well. 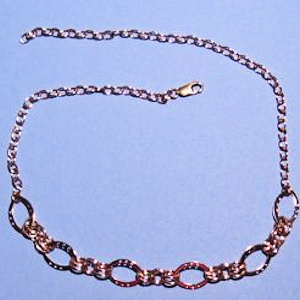 The chain is handmade with infinity and double heart links. Very unusual! I've added two charms - heart and key as well. 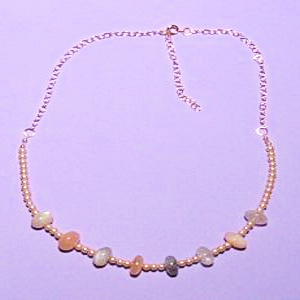 Multi Moonstone Rondelles and Freshwater Pearls Necklace is finished with chain. Just like the rainbow moonstone, multi-colored moonstone has that special shimmer which is called "schiller" or "adularescence" which make it very beautiful. 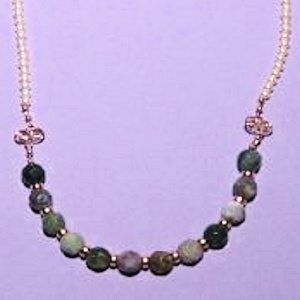 You can see the shimmer in the stones I selected for this necklace. 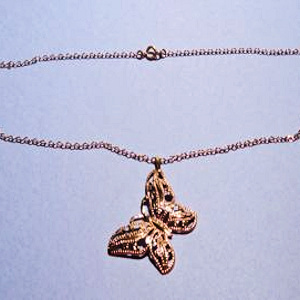 An asymmetrical Butterfly Pendant and Chain. August is the time on the East Coast to enjoy the Swallowtail butterflies in a garden. Maybe they may even land on you or your glasses! 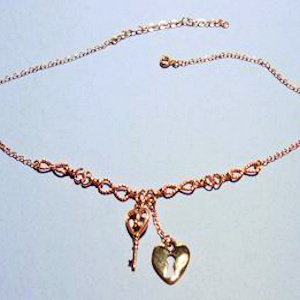 The lovely Beryl Beads and pale warm pink crystals go so well with Rose Gold heart and links. 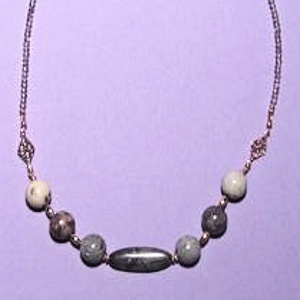 The Porcelain Jasper and Crystal necklace also has rose gold links. I do like this new chain. It's different from the chains I usually work with, and it's no longer available. I thought I'd try a simple design with the larger links in the center of the chain. Beryls are in the same family of gemstones as Aquamarines, Emeralds, and Morganite. 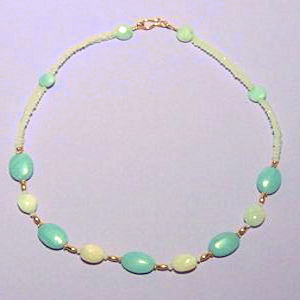 These are lovely pastel colors and there is good contrast between the smooth large pebble beads and the Beryl chips at the back. 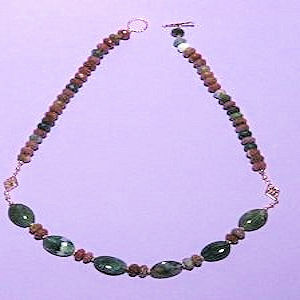 Here I used faceted Fancy Jasper gemstones with small freshwater pearls and rose gold links. 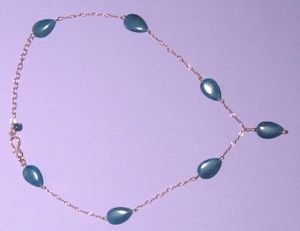 This delicate but strong station necklace has dark blue-green Apatite gemstone beads. I've designed it so it works with a variety of neck sizes.